This is a re-post of Rob's excellent thread explaining the different reticles. Lots of people are asking these days about getting into long range shooting, and what scope and reticle they should get. Disclaimer: I am not an "expert", but shoot my fair share of long range and steel matches with a bolt gun. After talking with a lot of people that do the same I think the following is some good basic information. Hopefully some of the other experienced long range scoped rifle shooters will chime in with their information. Opinions are varied. Mostly it comes down to what one is comfortable using, and what you have to know and remember to get the most out of the reticle you use. These days it goes without saying that if the option to have the knobs and the reticle both MOA or both MIL, it's better to do so. Not all scope manufacturers offer that option. It's not a deal killer, just nicer to have. There are literally dozens of reticle choices depending on who you get a scope from. Most are variations on a theme and offer more or less detail depending on the needs of the shooter. When it comes to MOA reticles pretty much the only choice is lines. With MIL you can have either lines or dots. Lines are exactly that, whereas dots are circles and ovals of specific size, but centered at the same place as a MIL line would be. The Nightforce NP-R1, a MOA reticle. The Nightforce MLR, a MIL reticle. Since by volume Leupold is probably the largest, their TMR, a MIL reticle. With MIL dots there are 2 types. The Army dot, and the USMC dot. Whether MIL or MOA, the reticle is not used just for ranging, but also for "holding over/under" for elevation, or "holding off" for windage instead of dialing the knobs. This is most useful when engaging targets at different ranges in rapid succession, or when making multiple quick shots in changing wind conditions. Some people will ask, "Which reticle gives better accuracy, or the ability to make a finer compensation for adjustment?" Well, when it comes to MILs, if you ask the Army and Marines, you will get 2 different answers because they each calculate it differently. The Army says a MIL is 3.53 inches at 100 yards, the Marines say it's 3.6" at 100 yards. When it comes to MOA there are also 2 different answers because some are made in Shooters MOA, which is 1" at 100 yards, and some are made in True MOA, which is 1.047 inches at 100 yards. But since most people can't make really fast rapid calculations in their head in the field, and often times in competition (or on the battle field) time does not allow one the luxury of pulling out a calculator, we'll go with the Army MIL definition and Shooter MOA because it makes math easy. I made the chart below (I'm pretty sure I got it right, and if I didn't I know someone will correct me) so you can see what what the different gradations are in inches at various distances. 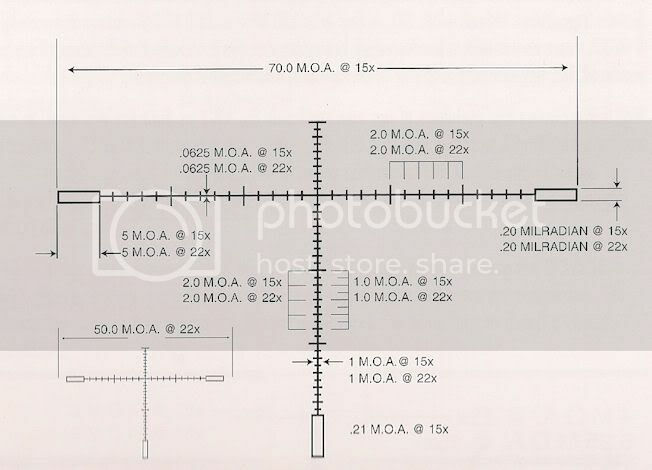 On most scopes with MOA lines the lines will have gradations of .5 and 1 moa, MIL line scopes will have them in .2, .25, .5 and 1 mil. This is not taking into account the thickness of the lines themselves, just the main horizontal and vertical lines. Mil dots are a different animal and take a lot more practice to use. God shoots a Remington 700, drives a Chevy Truck and carries a Glock 19. First, Having a calibrated reticle with known-marks is uber-important. You can't consistently hold for elevation or wind if you don't have some sort of calibrated scale to work with. Matching the knobs to the reticle is the 2nd most important thing. If you fire a shot and you observe that the impact was 2marks low and 1mark right, you know that you can adjust or hold 2marks high and 1mark left and your next round will be a hit if the wind has not changed. If your knobs don't match you reticle, you have to do more calculations to figure out how many marks in the scope equate to how many clicks on the scope knob. The 3rd most important thing is being able to quickly range the distance to target. This requires you to know the size of the target. The more accurate your assessment of the target's actual size, the more accurate your range estimation will be. The actual choice of either MIL or MOA is a ford vs chevy arguement. Both cars will get you to work every day and both measurement systems will get you hits when used properly. There are basically two camps supporting the two different systems. First, you have the MIL crowd. 1 MIL is 3.6" at 100yds and can easily be rounded to 3.5" for ease of calculations in your head. This rounding will create a 2.8% margin of error. The biggest thing the MIL crowd have going for them is the military's use of that system and all the development the supporting of MIL-specific tools, binoculars, scopes etc. The basic premise why you should get a MIL reticle is "because military/leo uses it". When used in a rangefinding role, the MIL system requires a more complicated calculation to figure out how far away a known-dimension target is located. 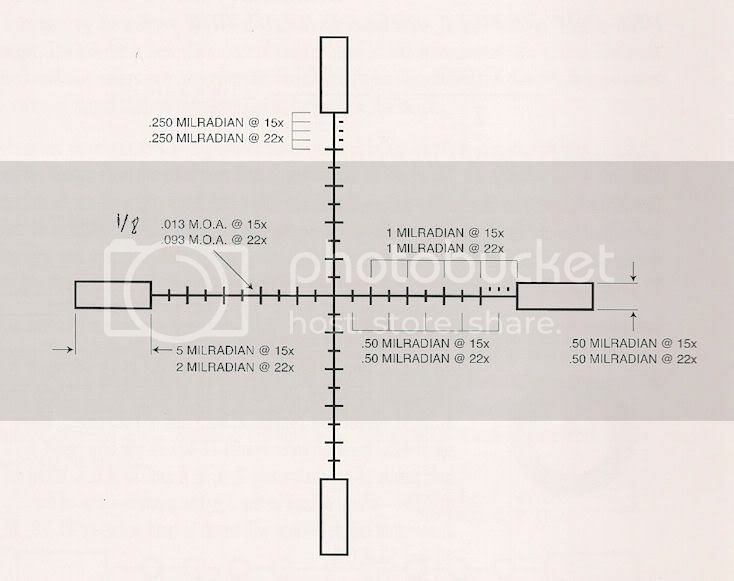 The accuracy of the MIL system at rangefinding relies on the ability of the user to divide up the milradian markings as precisely as possible when measuring the angular size of a target. To reach 1/10MIL reading, you have to divide up the space between two dots into 10 segments and then approximate how many segments your target occupies. Try this: hold your thumb and first finger out in front of you like you are measuring something. Now look across the room and find something that fits say 1/3 or 2/3 of the distance between your thumb/finger. Do not adjust your fingers to fit the object. Now determine how many 1/10's of that space between thumb/finger does the object fill. Is it 2/10? Is it 3/10? Is it 4/10? That's what you need to determine when measuring the height to 1/10 of a MIL. Advancements in Mil based scope reticles have added 1/2 mil hash marks and some scopes even have 2/10 hash marks to help you get a more accurate measurement when using the reticle to range. Then, you have the MOA crowd. 1 MOA is 1.047" at 100yds and can easily be rounded to 1" for ease of calculations in your head. This rounding will create a 4.5% margin of error. The biggest thing the MOA crowd have going for them is the ingrained use of inches as a common measurement system. The basic premise why you should get an MOA reticle is "because everyone knows what an inch looks like". When used in a rangefinding role, the MOA system has a less complicated calculation to figure out how far away a known-dimension target is located. It's easier to calculate a distance in MOA without a calculator as there is no "27.7 MIL factor" in the formula. The MIL crowd will be quick to point out that for the best accuracy of measurements, you still need to use a calculator and they are correct, but for a really quick (no calculator) range calculation, the MOA formula is simpler. The accuracy of the MOA system at rangefinding relies on the finer resolution of MOA markings when measuring the angular size of a target. To reach a 1/4 MOA reading, you only have to divide up the space between two hash marks into 4 segments and then approximate how many segments your target occupies. Now determine how many 1/4's of that space between thumb/finger does the object fill. Is it 1/4? Is it 1/2? Is it 3/4? That's what you need to determine when measuring the height to 1/4 of an MOA. The adjustment of a single 1/10 MIL click is roughy 3/8" at 100yds so that's the intrinisic accuracy of the MIL system. The adjustment of a single 1/4 MOA click is roughy 1/4" at 100yds so that's the intrinisic accuracy of the MOA system. So, while MIL clicks are not as precise as MOA clicks, they also requires fewer clicks to adjust the scope from one elevation setting to another elevation setting. This is an important factor when you need to adjust the scope from your 100yd zero to another distance quickly. Let's say your bullet drops 54" from your 100yd zero to your 500yd zero. That would equate to 10.25 MOA or 3 MIL of adjustment. If you were to compare two nightforce scopes, the MOA knobs have 10 MOA of adjustment on one turn and the MIL knobs have 5 MIL of adjustment on one turn. So, you can see it's quicker to turn the MIL knob 2/3 of a turn than it is to turn the MOA knob 1 full turn plus another click. However, at 500yds, a single 1/4 MOA click equals 1.3" while a single 1/10 MIL click equals 1.8" so you can also see that the MOA system has 30% finer resolution when trying to dial-in your impact precisely. My summary in support of the MOA system is that you have a finer resolution to work with that's easier to use for rangefinding without a calculator, but fewer companies making scopes with MOA reticles. My summary in support of the MIL system is that you have quicker adjustments and more support in the variety of scope manufacturers and the wonderful "mil-dot master" sliderule that eliminates the need of a calculator to quickly estimate ranges. Np-r1 is accurate at 22x, not 11x. The large hash marks are 2moa and the small ones are 1moa. At 11x, the large hash marks are 4moa and the small ones are 2moa. ok, then why does the NF have the dot at 11x? That's to show you where the half-power point is to be able to double the reticle values. On the old school mildot reticles you must check their true size, they can vary from 0.2 to 0.22 Mils.... The NightForce Mildot I realy like, it is 0.25 Mils and a hollow circle with dot in middle (all except the 3.5-15x F1 which doesn't have the dot). Most of the SFP scopes range correctly at max power, with an exception being the Nikon Buckmaster 4-14x, which ranges correctly at 12X. Also on the NightForce 5.5-22x, just because the "dot" is at 11X does not mean that is the correct setting for half power ranging. You must verify this in the field and put a mark (if different) at the correct mapping location..